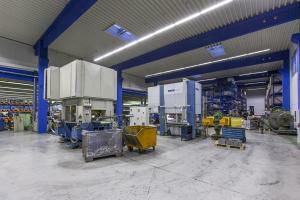 As a flexible stamping business, Schulz Stanztechnik manufactures various stamped and stamped bent parts for the most diverse areas of application from conveyance technology components, the automotive industry to mechanical components such as washers and angle connectors or entire assemblies. We place particular emphasis on high-quality and punctual manufacture and delivery of the ordered products and services. We are also in a position to meet special requests of our customers at short notice. Alongside the actual stamping process, Schulz Stanztechnik carries out numerous additional tasks, such as the creation of threads, use of installation parts or the installation of several components to the stamped parts. These activities can be carried out during stamping as well as in a separate work process. A large proportion of our stamped parts leave the company as installed complete parts. 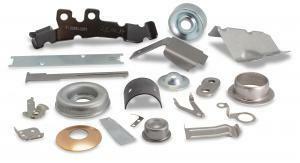 We supply stamped parts with all regular surface coatings. Special coatings are available on request. 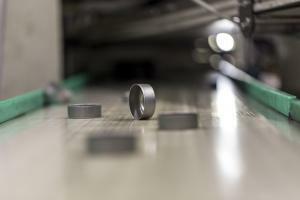 We can process coated materials without damage to the surfaces. Our fleet of machines comprises several stamping machines with a nominal load of up to 4000 kN. The largest tools, designed as follow-on composite tools, are up to 1400 mm long. We have at our disposal diverse installation machines and special machines for our main products, which are predominantly fully automatic. We process high-quality steel up to a thickness of 6 mm. Alloy tool steels and stainless steels are processed up to a material thickness of 5 mm. Other materials such as brass, aluminium etc. are also used. We are also in a position to process coated materials without surface damage. Our success in constantly implementing new products in the production process and the maintenance of the highest quality requirements make Schulz Stanztechnik an in-demand contract manufacturer: Numerous companies – including automobile suppliers – contract out to us the manufacture tools and stamped parts in various finishes and using diverse materials in accordance with technical drawings. We carry out our contract manufacture work in many variants: No matter whether you make the tool available to us or whether we construct it and make it for you; or whether you make available the raw material to us and we only perform the stamping; or whether you only require a specific step of manufacture or additional assembly work. Your product – which we manufacture to the required quality and deadline – is the deciding factor.